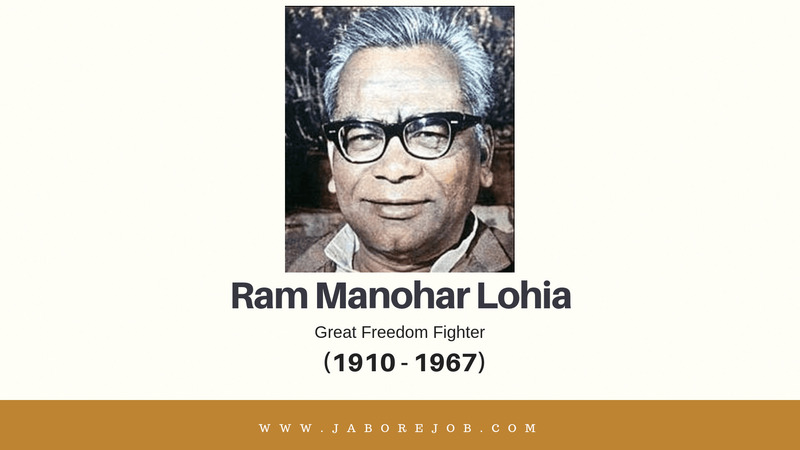 Ram Manohar Lohia was a great political leader and fighter of Indian freedom. Lohia was strongly influenced by Mahatma Gandhi’s ideas that brought him the feeling of freedom. He was widely known for his significant participation in the Indian National Movement. He was a wonderful person who devoted his entire life to India’s struggle for freedom as a socialist and Indian freedom fighter. He was a man of rare quality and independent thought, working hard to create a society that would provide justice for the poor, backward and women. Although Lohia had a good affinity with Jawaharlal Nehru, he quarreled with him on many political issues as well. Lohia was born on 23rd March 1910, in the village of Akbarpur, Uttar Pradesh. Her father’s name was Hira Lal who was a nationalist, and a teacher. His mother died when he was young. Rammanohar Lohia graduated in B.A. from Calcutta University in 1929. He also completed his PhD. at the University of Berlin in Germany in 1932. His first contribution as a nationalist leader was to organize a ‘Hartal’ on the death of Bal Gangadhar Tilak. In 1928, Rammanohar Lohia joined the protests against the Simon commission. He was a great socialist with a fearless and dynamic personality. Before Independence, Lohia went to prison several times for the good of people. He attended the League of Nations in Geneva and the Maharaja of Bikaner. He protested against Bikaner’s Maharaja movements from the visitors’ gallery as he supported the British government. Lohia formed the Association of European Indians and became the club’s secretary. He focused more on the expansion of Indian nationalism in other parts of the world. Later, he joined the Indian National Congress. Lohia was attracted to socialist culture as soon as he joined the Indian National Congress. Lohia played a vital role in founding the Socialist Party of Congress in 1934. Come, let us unite to restore Hindi to its original glory was his slogan. Lohia was an active participant in many political works. He organized the association of European industries in Europe. After this incident, Ram Manohar Lohia joined the Indian National Congress and created the Socialist Party of the Congress in 1934. He was appointed Secretary of the Congress Committee of India in 1936. Because of his participation in the movements, Lohia was arrested in 1939. He was accused of inciting to boycott government institutions. He was also arrested in 1940 for his article “Satyagraha Now.” In 1944 he was again imprisoned in Lahore. He published and distributed posters, pamphlets on Do or Die during the Quit India movement in 1942. With Aruna Asaf Ali Lohia published the monthly newspaper of the Congress Party with the name “Inquilab”. After India’s independence, he pleaded for the no-congress strategy in 1963. He achieved tremendous success in 1967 and the Congress was defeated in 9 states by the governments of Samyuktha Vidhayak Dal. He remained single throughout his life.